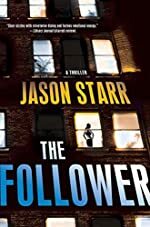 Variety is reporting that HBO has ordered an adaptation of the 2007 thriller The Follower by Jason Starr for a series. (It isn't clear from the article if "series" means mini-series or weekly series.) Bret Easton Ellis (American Psycho, Less than Zero) is writing the screenplay. Though the book is a suspense novel about one man stalking one woman, the Variety article suggests the HBO adaptation will be a dark social satire chronicling the dating lives of a group of twentysomething New Yorkers as seen through the eyes of a stalker.